Researchers from the University of Southampton are aiming to develop a 'smart' thermostat to help UK households save money on their energy bills. 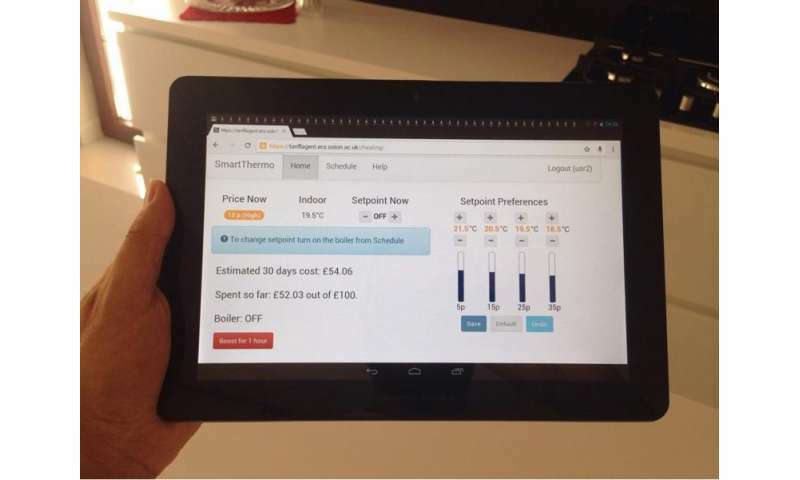 To understand how users interact with smart energy systems, a team of researchers from Electronics and Computer Science (ECS) at Southampton and the University of Zurich produced three different smart thermostats that automated heating based on users' heating preferences and real-time price variations: a manual one through which participants explicitly specify how the heating should respond to price changes, and two learning-based ones that employed an artificial intelligence (AI) algorithm to automate the temperature settings based on learned households' preferences. University of Southampton PhD student Alper Alan, co-author of the study, says: "People were more aware of their energy consumption and were happy with the autonomous system controlling their heating on their behalf given real-time prices. We saw that people liked being able to control their home from anywhere they are. We also observed in all three treatments, most people reduced their temperature at high price levels. We found that people are ready to incur a reduction of four degrees celsius to save money. They said that even though the house was a bit colder than normal, they were okay with it since it was not that cold and they were saving money." However, following interviews with study participants it was clear that the price was not only the factor that users considered for heating their home.. Other key factors were outside weather, occupancy and daily activities within the house. Some participants explicitly stated that the use of the thermostat could be more convenient if it could learn their occupancy patterns.. Also, outside weather and the activities that they perform during a day within the house have a significant impact on how people feel the indoor temperature. Dr Enrico Costanza, co-author from ECS, says: "Future design of learning thermostats should not only take into account occupancy patterns and outdoor temperatures (such as the Nest system), in addition to price preferences, but also people's daily routines and activities. For instance, we saw that most participants preferred to have the heating on when they shower and have the heating off when they use their oven or perform physical activities." Dr Sarvapali Ramchurn, co-author from ECS, adds: "Smart energy systems that use machine learning techniques are increasingly integrated in all aspects of our lives. These findings will assist designers in improving user experience, which in return will help us in controlling home heating with real-time pricing and benefit from them."